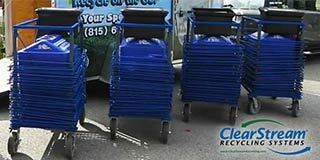 In 2005, Resource Recycling was the first to publish, in a Facility Focus article, the success of ClearStream Lend-A-Bin partnerships in the Portland, Oregon Metroplex. 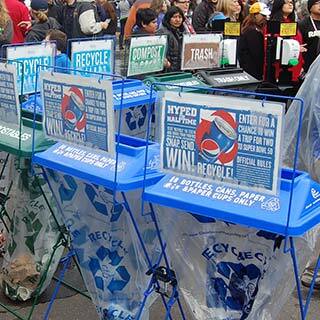 Lend-A-Bin programs have continued to spread to hundreds of customers doing tens of thousands of events annually. A one-time investment in ClearStream bins promotes successful recycling and increases safety at public space events. It gives public agencies and local governments an opportunity to consolidate recycling services and eliminate duplication. One set of bins can provide durable infrastructure to multiple organizations for many years. "We provided our County Fair with 100 ClearStream bins, and they’ve utilized them all. And we provide them for the Cities and Towns, so they can loan them out to different organizations that are having events. We have a nice little form that we use to make them responsible for it”. ClearStreams can be staged at multiple locations throughout the facility/venue. They can be used at multiple events throughout the campus area and then stored in central locations between events. 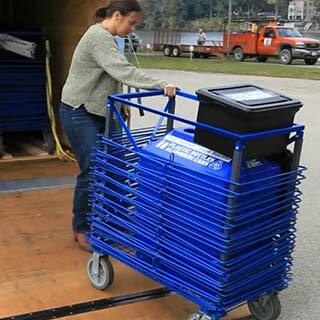 ClearStream carts can also be right sized to the needs of your staging areas. 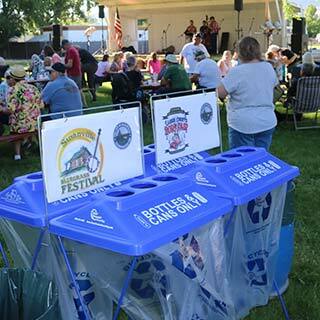 When the Fairgrounds are rented out, the outside event organizers can use the bins to green their event. The venue can also offer the use of Primetime advertising displays on the ClearStream containers. Outside organizers can sell these sponsorship opportunities to their clients, raising additional revenue. Are you Throwing Away Your Money in Non-transparent Containers? Recycling for REAL requires clear containers to show people what you want them to do. Many venues and events use opaque containers and have converted to single stream recycling collection. Prices for mixed recyclables have recently collapsed. Recycling collection that does not collect marketable recyclables is only an expensive collection program. ClearStream is the clear answer to single stream collection in opaque, nontransparent containers. ClearStream bins use clear bags with 7 different lids that specify exactly the type of material to recycle. Guests intuitively know what to do. They place their discards into the correct bin with contamination rates below 10%. 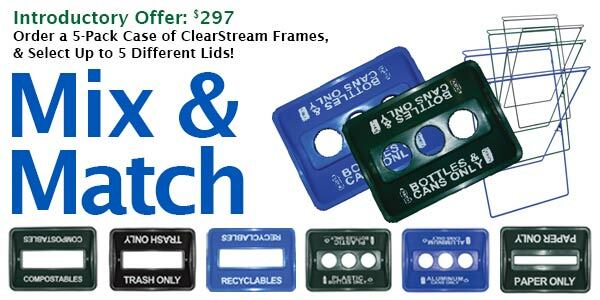 Order a case (5-pack) of ClearStream frames, and select up to 5 different lids to test in your own environment. Each lid specifies the type of material to be collected to avoid contamination. Get cleaner, source separated recyclables with clear containers and clearly marked source separated lids. Choose from: Bottles & Cans Only, Paper Only, Aluminum Cans Only, Plastic Bottles Only, Compostables, Recyclables, and Trash Only. Please email us or call at (855) 411-4321 to get this deal. 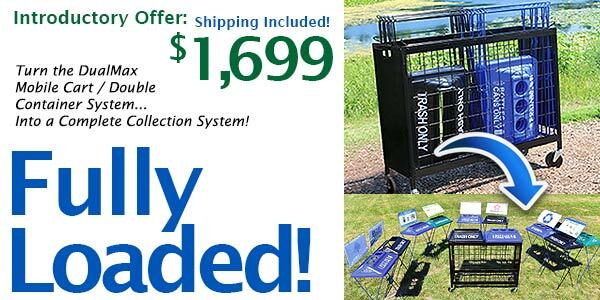 The towable DualMax is a two-bin, wheeled cart that holds and provides mobility for 10 frames and lids. Shipping included!